We have designed some stunning flower needlepoint kits. 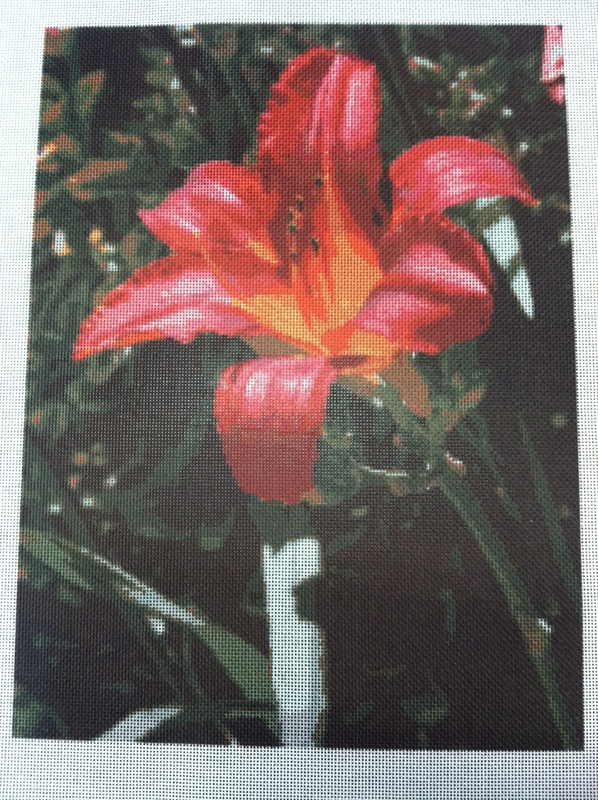 We made this flower needlepoint canvas yesterday and I had to take a picture of it! We will be adding it to our website store soon, but if you are interested in ordering it, please contact us at info (at) NeedlePaint.com. Do you have your own photos of flowers you want to stitch? Try to design your own needlepoint canvas from a photo at www.needlepaint.com. All needlepoint canvases are not created equal. I’ve seen quite a few ways to put a design on canvas and hand painting stitch by stitch is still the best. Why would a company that prints needlepoint canvases admit this? We want to be upfront with our customers, and of course, we want to let you know that we also now hand paint custom needlepoint canvases! Here are the major things to consider if you want purchase a hand painted canvas from Needlepaint. Stitch Guides – Our hand painted needlepoint canvases will not include a stitch guide for reference. Instead, we will paint each color on the side of the canvas so you know how many colors there are and you will have to match using these. Cost – Generally hand painted canvases cost about 20% more. In some cases with simple larger designs (stockings), it may be the same as printing. Designs – We can paint most designs and photos. Needlepoint Dogs are ever popular, but we can also paint people, cats, and homes. Or, if you want us to coordinate with an old needlepoint christms stocking, we can do that. Kits – We will be happy to add floss or yarn to your order. Refunds – We are confident you’ll be happy with your canvas! We offer 100% refunds within 60 days of ordering. Ordering – You will need to call us, or email us to order a hand painted canvas, our needlepoint contact information is on our website, Click Here! Please be aware, that we are offering this as an additional service, we still believe that our printed canvases, with our color groupings (we call it “needlepainting”) is the best option for turning photos into needlepoint kits. All of our printed canvases are stitch counted and come with a stitch guide, color aid, and are matched to DMC floss. We’ve gotten great feedback, which you can read in our latest blog – needlepoint reviews. Let us know if you have any comments or ideas in the hand painted vs printed canvas area. This topic can bring up some heated arguments, but I’d be happy to have an open and honest discussion! Since the holiday rush ended in January, we’ve had some extra time to work on fun needlepoint kits. We know that stitchers always need new projects to work on, and are happy to help. Two of the needlepoint kits I’ve worked on started with phone calls. The first was a picture of boy in a pumpkin patch. The details and colors were amazing, and the customer had some special requests. First, they prefer to use interlock canvas. Second, they really prefer perle cotton over embroidery floss. The interlock canvas was easy, as we have some in stock, but for the perle cotton, it was a bit trickier since the customer did not have close access to any needlepoint shops. Being in Denver, we do have a great needlepoint shop, Diversions. For a small fee, we can pick out alternate fibers that they keep in stock. Another fun project came from Australia last month. Although we don’t list it on our website, we do ship there. Their idea was to needlepoint a beach scene from an old movie. This week, we also received a lot of positive feedback, and we love to hear it! Our goal is to make sure every project is great, and our customers love them. If you order from us, please send us feedback, we are always looking for ideas and suggestions. “The canvas looks great! I’m so excited…as is my daughter! Her teacher is going to love it. As a stitcher, I love the stitch guide…so wonderful to have on those close calls (do I stitch here or not?). Thank you for including it. And, the canvas is quite crisp. Thank you for taking the time and effort to make it so clear. My daughter is a new stitcher, and it will make quite a difference in her experience!” Marlena – Mass.